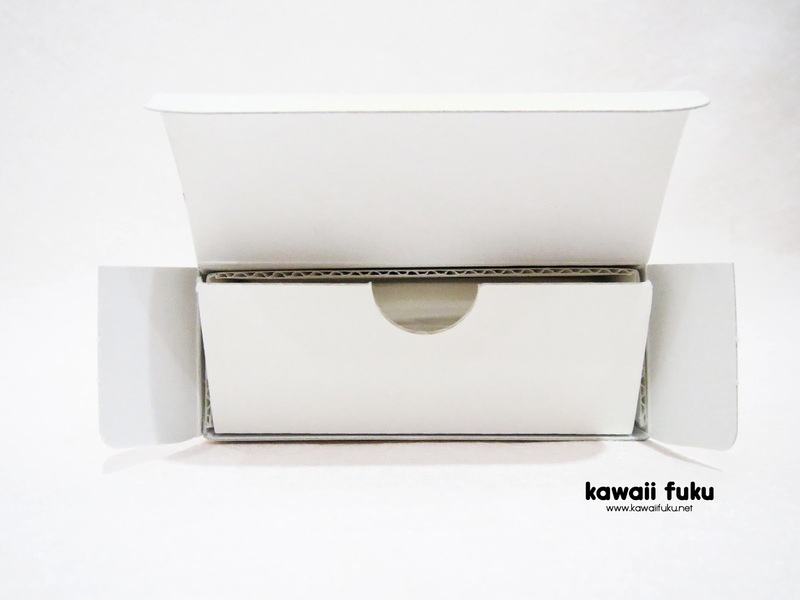 The outer box is so simple with broken white colour all over it. And on the back side, you can find the ingredients. 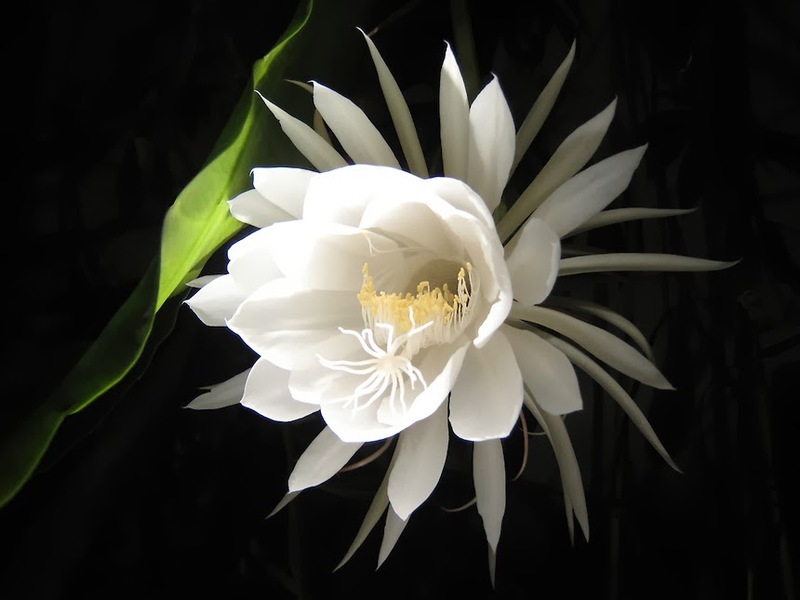 Tsukika powder foundation contains Night-Blooming Cereus flower extract as the main ingredient. On the other side of the box, you can find manufacture date and also the shade code. FYI this powder foundation has the same shade code with the liquid foundation. It has 8 shades available ; 22, 23, 41, 41Y, 44, 51, 52, 52Y. I got mine in 41Y, both for the liquid and powder one. OMG! I was shocked when I open the box. I found another box inside the box! It surprises me a lot. Menard do put more attention about the product safety. 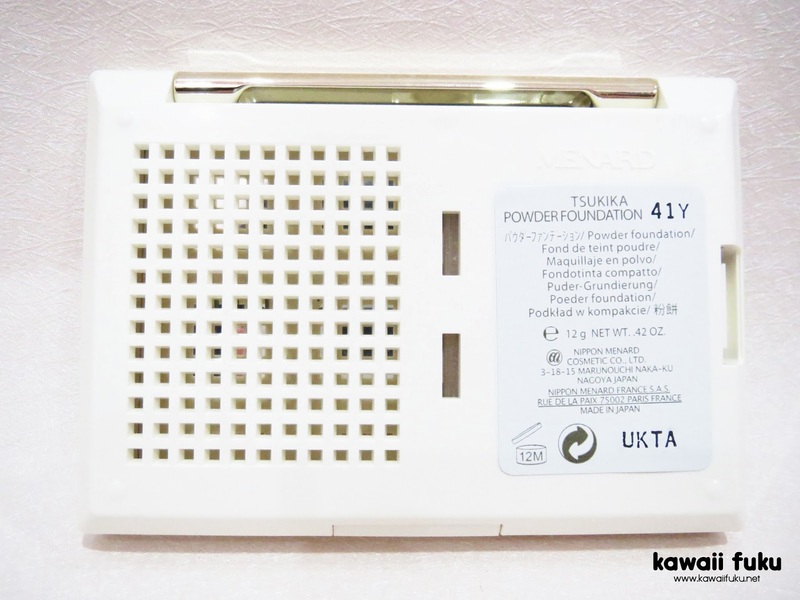 The inner box will make sure that the product (or let's say the powder) won't break easily. I opened the inner box and find the sponge isn't inside the case. 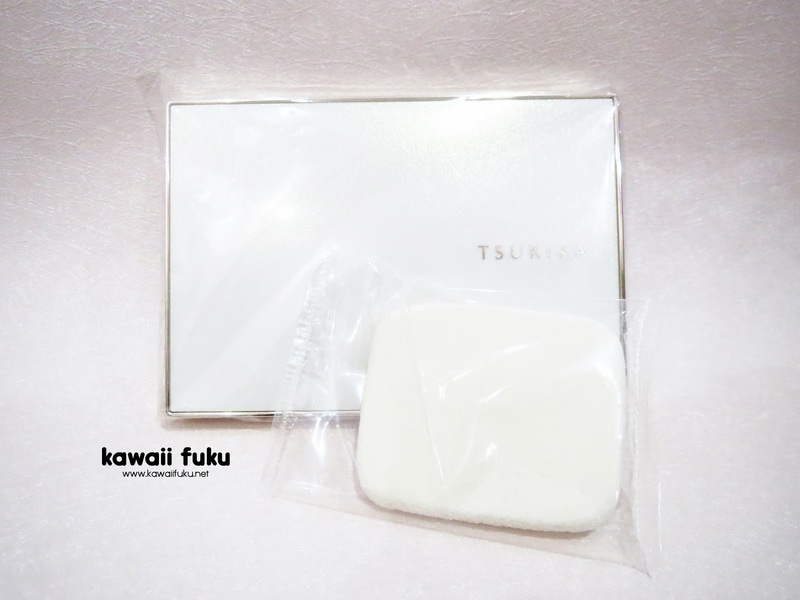 Usually when I bought a powder product (either compact powder or powder foundation), I'll get the sponge inside the case. But this one is different. I think Menard puts the sponge outside in the name of hygiene. As you can see that the sponge is also packed inside a plastic package. Well, not only the sponge but the powder case also packed in a plastic, even though it already packed in two layer of outer box. 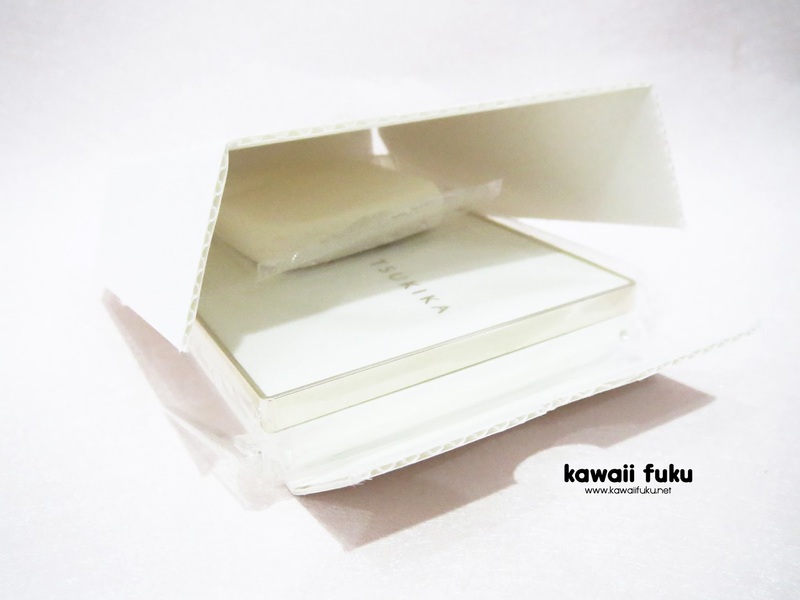 The packaging looks so simple in all shimmering white colour, but I find it nice. I like it. I also like the gold lining on the case. It's still simple indeed, but somehow I like it. What's the best features that this powder foundation have? 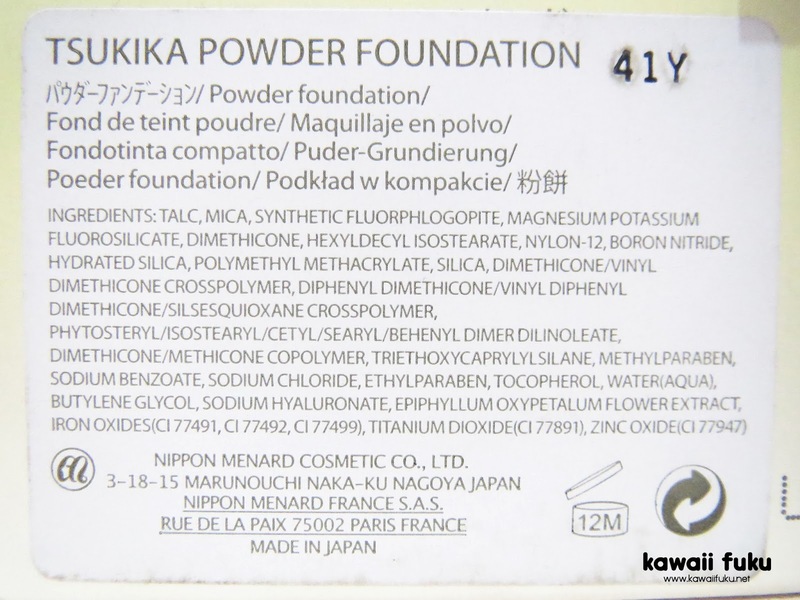 Tsukika powder foundation can covering pores and ensuring smooth skin. It also can concealing dullness and making skin brighter and clearer. And because it's water-based, it can keeping skin moist and supple. 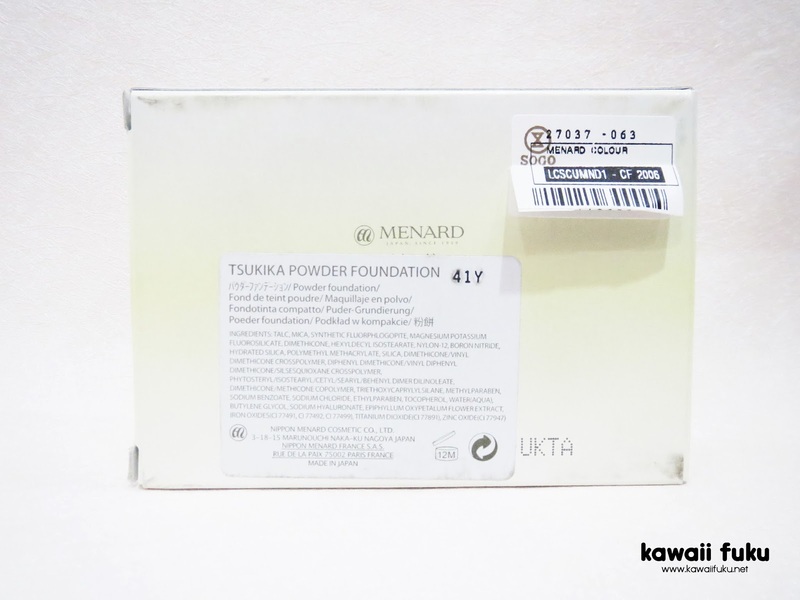 Tsukika powder foundation can protects skin from UV rays because it contains SPF SPF 24 and PA++. SPF will give you protection from UVB rays that affect the skin epidermis. On the back of the case, you can see an information sticker is attached with the shade number. There's also a plastic as a barrier between the powder and mirror. The powder is refill-able! Yay! And it's easy to take off the powder pan and change it with the new one once you hit the pan. Well, I think you can imagine how easy to take the powder off from the photo above. Just pluck off the empty powder pan and replace with the new one. 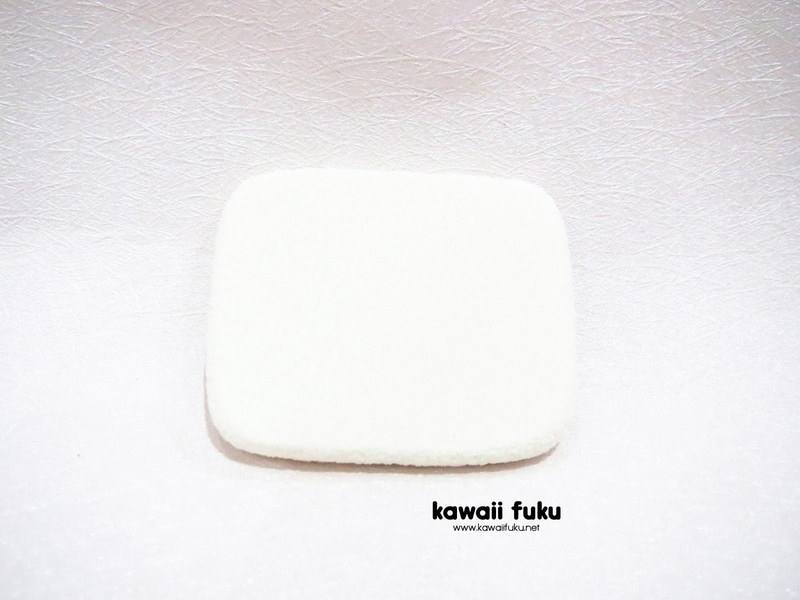 This white sponge is included. 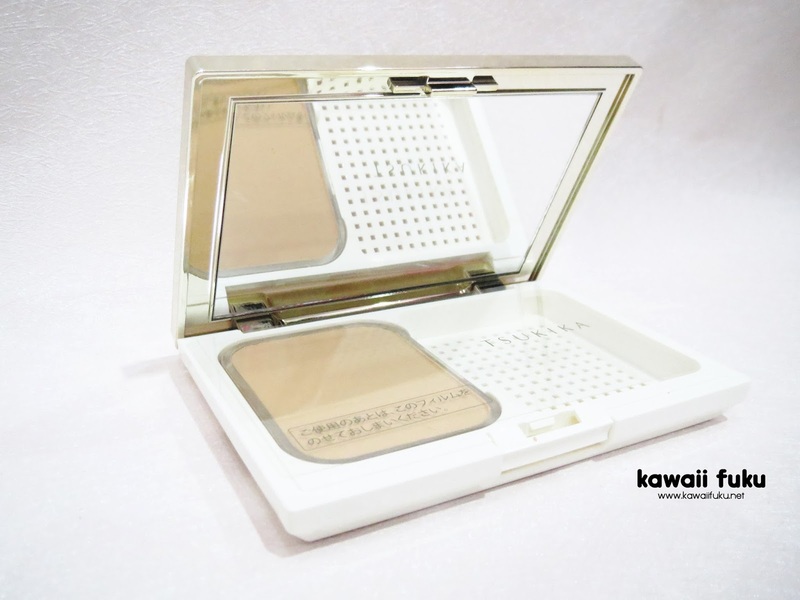 The powder case also have a mirror, a quite big one. I can see almost all my face on this mirror. It's great for touch up! 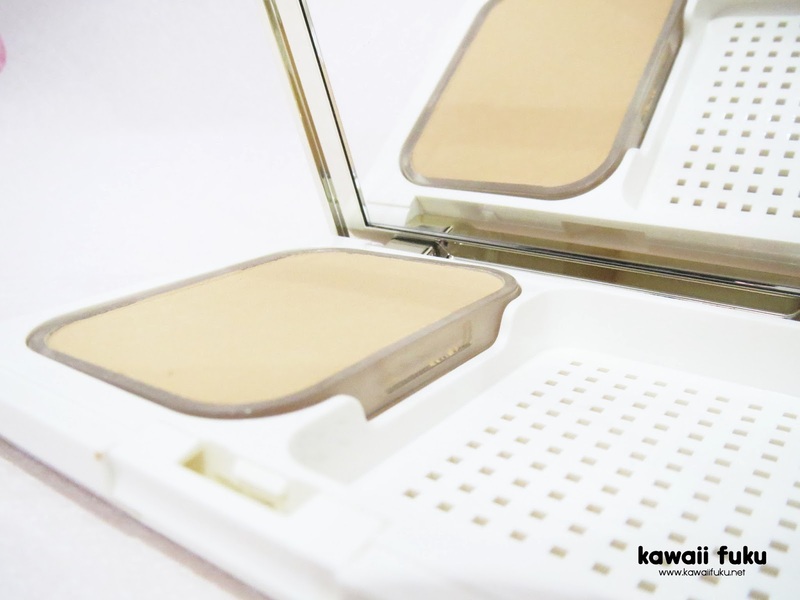 So with mirror and sponge included and a compact size, this powder foundation is definitely travel-friendly. This is the swatch on my hand. 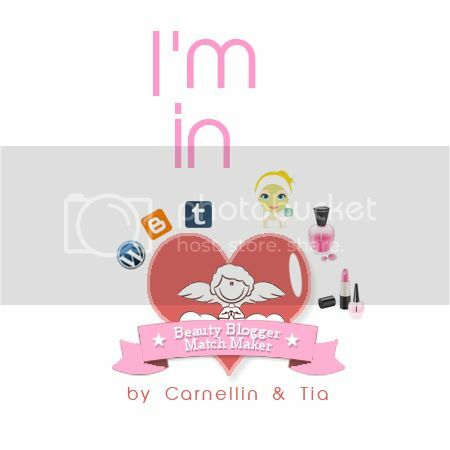 I make two swatches, the first one with Tsukika Powder Foundation and the second one with Tsukika Liquid Foundation. Just to show you that both of them have exactly same shade (both are 41Y shade). 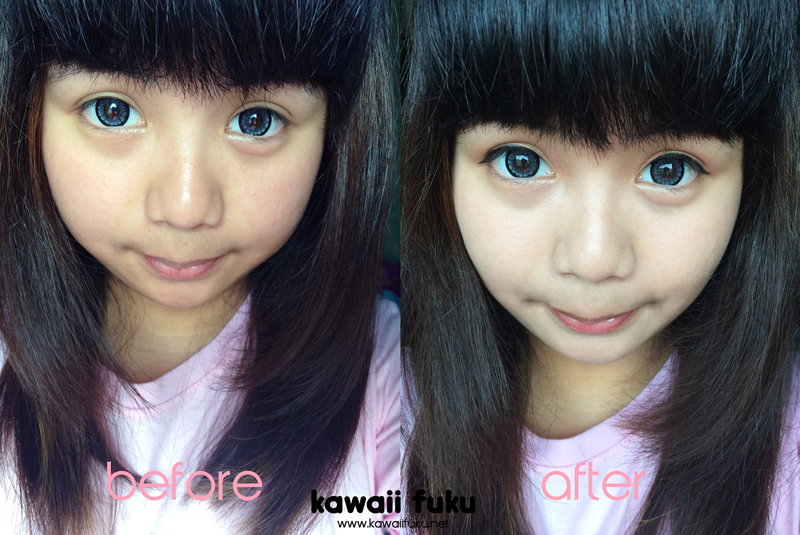 This is the comparison between my bare face and using Tsukika Powder Foundation. 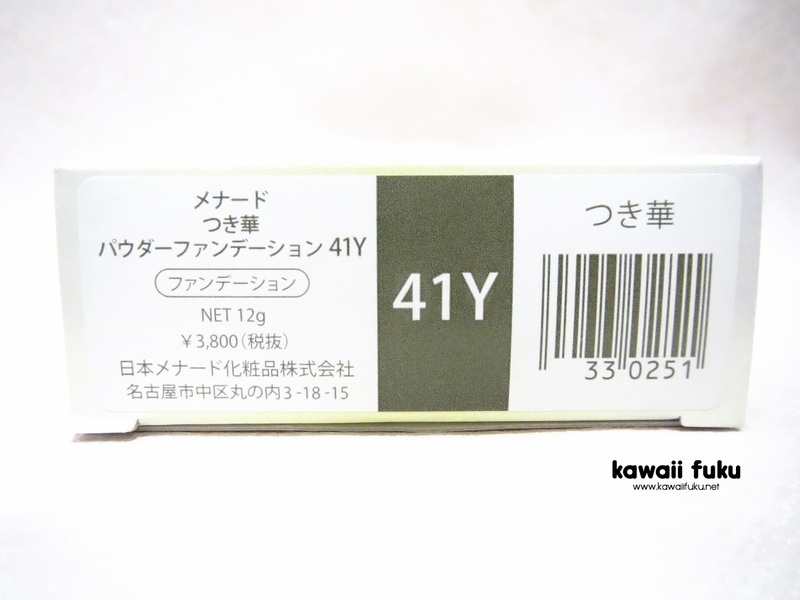 It also remove dullness and make my skin more even. What make this powder foundation different with the liquid one is the finish result. 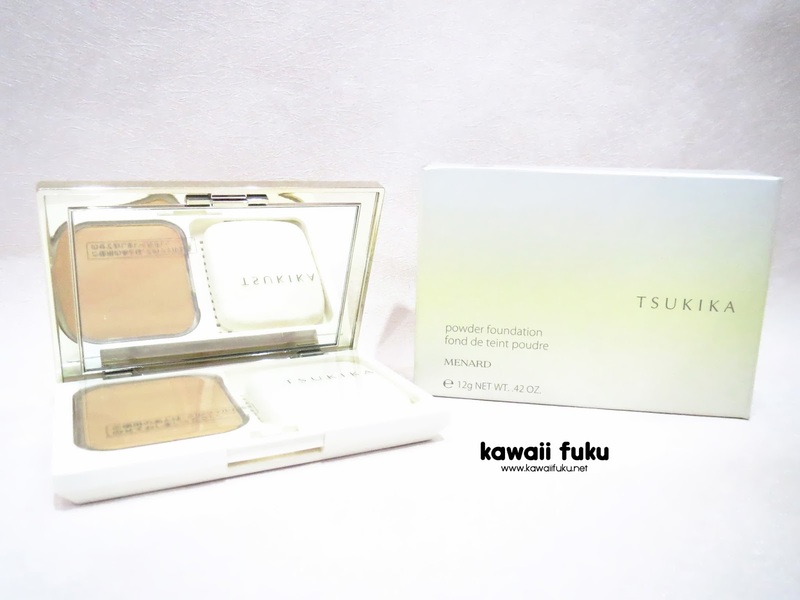 Unlike the liquid fondation which gives me glowing finish, this powder foundation gives me matte finish. But once it blends with sebum on my face, it will give natural glowing look. Not to mention that this powder foundation is easier to apply. If you looking for an easy-to-use foundation, powder foundation will suit you the best. Basically it's just like compact powder, but also contain foundation, so the coverage will be better than just a compact powder. This powder foundation is also light-weight. 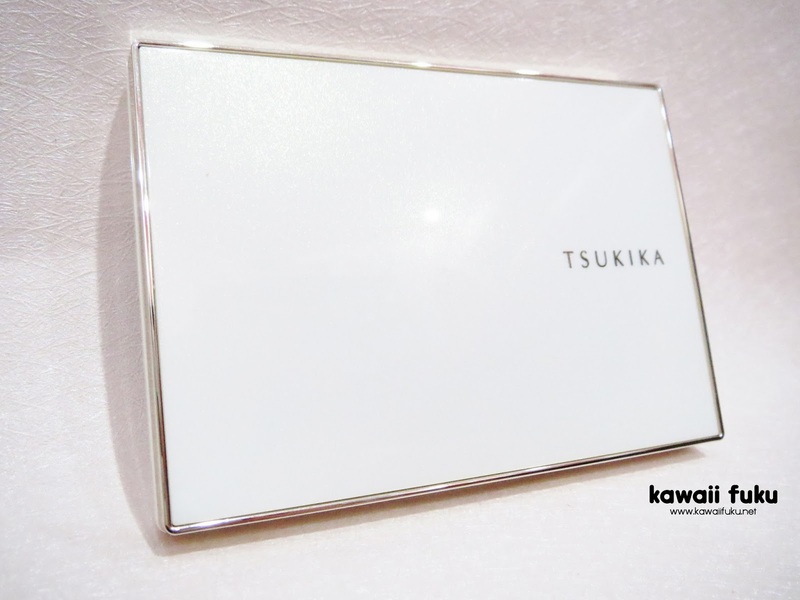 After all, this foundation is easy to use, easy to carry, travel-friendly, and great for touch up (since it has big mirror and a sponge inside). 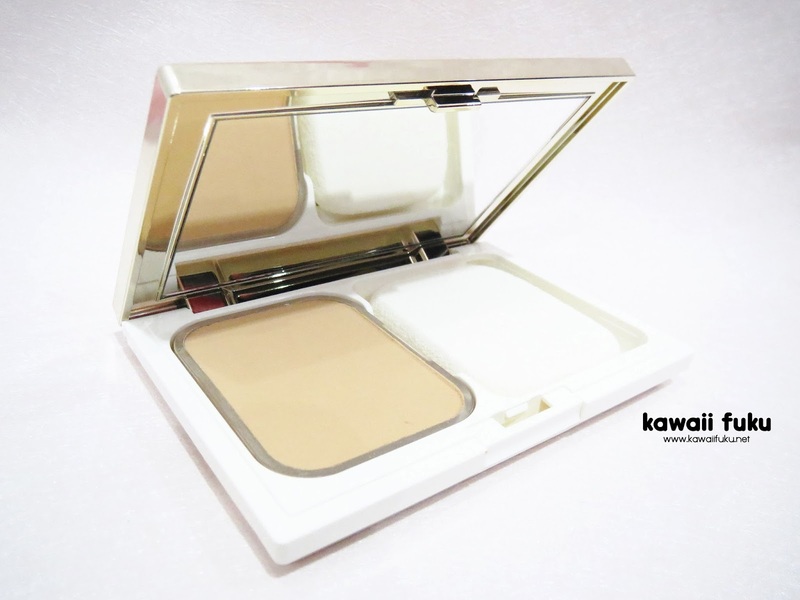 People with all skin type can suit with this powder foundation. And for those who have dry skin, don't worry about your skin becomes more dry. Because this powder foundation gives me matte-glowing finish without making my skin more dry.